After the Mueller report — what comes next? Two days before the 50th anniversary of Robert Mueller being seriously wounded while leading his platoon against a numerically superior enemy in Vietnam, his latest service to the nation was released in the form of the Special Counsel's Report. In a morning press conference before the release, Attorney General William Barr seemed to give a friend of three decades his due after two years of lies and slander by our president. “I would also like to thank Special Counsel Mueller for his service and the thoroughness of his investigation, particularly his work exposing the nature of Russia's attempts to interfere in our electoral process,” Barr said. As David and Louise Turpin await a Friday sentencing for torturing their 13 captive children, ABC News has obtained a recording of the 911 call the couple's 17-year-old daughter made to police, alerting them to the horrific situation. Both of the Turpin parents pleaded guilty to a total of 14 charges in February 2019, including a count of torture, multiple counts of false imprisonment, child endangerment and adult abuse. They face 25 years to life in prison if convicted. French President Emmanuel Macron is to outline a reform plan drawn up in response to nationwide protests next week after the key policy action was delayed by the Notre-Dame fire, the presidency said Friday. Macron will hold a press conference on Thursday at 6:00 pm (1600 GMT) to make the announcements. He had been scheduled to make an address last Monday but immediately cancelled its broadcast after the devastating fire erupted at Notre-Dame cathedral that caused significant damage to the Paris landmark. Ukrainians head to the polls this weekend to choose between a comedian who plays a Ukrainian president on TV and a chocolate baron who plays a Ukrainian president in real life. For better or worse, Ukraine is the bridge that unites—or divides, depending on your perspective—Russia with the West. A decade ago, Ukraine was making moves toward joining the EU without sacrificing its substantial trade and interpersonal ties to Russia. None of these is legit, even though they were shared widely on social media. CLAIM: Man who threw boy over Minnesota mall balcony is a Somali immigrant. THE FACTS: The man arrested in the case did not emigrate from Somalia, as posts circulating on social media said. North Korea's state news agency said Kwon Jong Gun, in charge of U.S. affairs at the foreign ministry, had warned that no one could predict what would happen if Washington did not abandon the "root cause" that compelled Pyongyang to develop nuclear weapons. 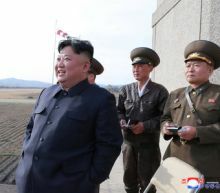 The statement came shortly after North Korean leader Kim Jong Un oversaw the test of a new tactical guided weapon, North Korea's first weapon test since a summit between him and Trump broke down in late February. U.S. officials appeared to play down both developments, with acting U.S. Defense Secretary Patrick Shanahan telling reporters at the Pentagon that while there had been a test, it was "not a ballistic missile." A spokeswoman for the State Department said it was aware of the report about Pompeo and added: "The United States remains ready to engage North Korea in a constructive negotiation." Despite the summit breakdown, North Korea had maintained a freeze in nuclear and ballistic missile testing in place since 2017,and Trump has repeatedly pointed to that as an important outcome from a year of engagement with Pyongyang. Videos of the incident were posted to social media during a Monday afternoon after-school event held at the church at which Dempsey was speaking of Easter and the crucifixion. In one of the videos, Dempsey is seen standing still while students take turns spitting on him, some striking him, while other students are heard laughing. The mother of a youth, who reportedly employed a knife handed to him by Dempsey to cut the associate pastor at his invitation, said she was alerted to the video by a friend, according to an on-camera interview with WBNS-TV. Israeli forces destroyed two apartments in the occupied West Bank on Friday that housed the family of a Palestinian accused of killing an Israeli woman in February, the army said. Soldiers surrounded the apartment block in the flashpoint southern city of Hebron beginning late on Thursday. 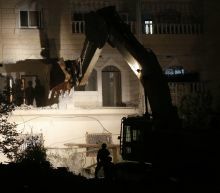 They then destroyed the two apartments that were home to the family of Arafat Irfaiya, 29, with the use of heavy construction equipment in the early hours of the morning. South Carolina authorities said Friday that the death of a fifth grade girl at school last month was due to natural causes and not a fight with another student, which they described as lasting only seconds. Solicitor Duffie Stone said at a press conference that 10-year-old Raniya Wright died of a congenital condition called an arteriovenous malformation, a tangle of abnormal blood vessels in the brain. Raniya had been taken to the doctor after complaining of headaches about two weeks before she died. Donald Trump's description of Robert Mueller's investigation into Russian influence in the 2016 presidential campaign and the White House's efforts to keep it secret returned to form Friday. Just weeks after he claimed it had offered him “total and complete exoneration,” the president returned to attacking the document he and his attorney general had so confidently assured the country had cleared him. 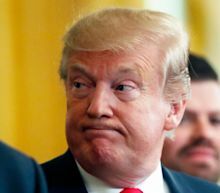 On vacation at his Mar-a-Lago golf resort in Florida, Trump abruptly halted his reversal of his reversal in midsentence, so we don't know what further imprecations he was intending to heap on the special counsel. The FBI arrested a 69-year-old New Mexico man who allegedly illegally detained immigrants crossing the border under the guise of working for the United States Border Patrol. Larry Mitchell Hopkins, who runs The United Constitutional Patriots (UCP), an armed border militia group that spreads far-right conspiracies and rounds up asylum seekers on the border, was arrested by FBI in New Mexico Saturday on charges of possessing firearms and ammunition as a convicted felon. Recent video footage released by UCP shows two members holding what appear to be semi-automatic rifles near immigrants, many of them children. Google explained in a new blog post on the matter that Android users in Europe will get search app and browser options, and showed the world what those prompts will look like. The new screens will be shown the first time a user opens Google Play after receiving an update. We're looking at two screens, one for search and one for browsers, as follows below. Syrian President Bashar al-Assad on Friday called for progress on a stalled buffer zone deal around jihadist-dominated Idlib region ahead of fresh talks aimed at ending his country's eight-year war. Assad met envoy Alexander Lavrentiev from key ally Russia in Damascus to discuss the negotiations due April 25-26 in Kazakhstan. Iran and Russia are the major supporters of the Syrian regime, and along with rebel backer Turkey have sponsored repeated rounds of talks in the Central Asian nation. The structure of the Notre Dame Cathedral has been saved from a massive fire that had threatened to gut the 800-year-old landmark in Paris, fire officials said late Monday. The blaze collapsed the cathedral's spire and spread to one of its rectangular towers. "Two-thirds of the roofing has been ravaged,” and firefighters would work through the night to cool down the building, Gallet said. Twenty years later, I still find myself doing a mental gap analysis of Columbine, though nothing can ever make anything whole. What I always come back to, which makes me dizzy, is contemplating what the world is lacking because these 12 young people and this teacher were abruptly removed from humanity's equation one April morning as the last millennium's final days waned. All because of two young men who decided that violence would be their final path forward. As the Ukrainian election heats up in April 2019, the incumbent President of Ukraine, Petro Poroshenko made a bold claim: Ukraine has made an indigenous cruise missile with a range of 1000 kilometers, capable of carrying a 150-kilogram warhead. Using long-range conventional cruise missiles for deterrence against Russia is not without precedent. The American JASSM long-range aerial-launched cruise missiles are popular exports to countries bordering Russia, with Finland buying regular JASSMs with ranges of around 370 kilometers and Poland buying JASSM-ERs with ranges in excess of 900 kilometers. The STAYUMBL license plate is notorious on the road and social media. Folks say the driver behind the wheel will speed up, cut people off and then slam on her brakes, sometimes causing a crash. The first page of special counsel Robert Mueller's report about purported Trump collusion with Russians during the 2016 presidential campaign stated that the original source about hacking was the Democratic National Committee. "In June (2016), the Democratic National Committee and its cyber response team publicly announced that Russian hackers had compromised its computer network," notes the report. The federal government spent more than $70 billion on intelligence in 2016, including $10 billion for the National Security Agency to undertake electronic surveillance globally. That the origin for claims of foreign activity in the election came from a political party and not lavishly funded intelligence agencies should have raised red flags about the seriousness of the allegations. A former US Marine who was allegedly involved in a raid of the North Korean embassy in Madrid has been arrested, according to sources familiar with the case. Christopher Ahn was arrested on Thursday in connection with the incident, when a group of at least 10 people stormed into the embassy, restrained and physically beat some personnel and held them hostage for hours in February. Spanish investigators have said the group stole computers and hard drives before fleeing to the United States, where they shared the stolen material with the FBI. It's official: the first widely available smartphone with a foldable display is a piece of junk. Feel free to check it out when it hits store shelves next Friday. But for the love of whatever or whomever you pray to, don't buy one. Chicago Bears defensive back Ha Ha Clinton-Dix tweeted Thursday that the University of Alabama is holding his degree, which he earned in 2018, over a $1 unpaid debt. It's unclear why Clinton-Dix owes Alabama a single dollar but he should have no problem finding the pocket change as he recently signed a one-year, $3 million deal with the Bears in the offseason. Four Turkish soldiers were killed on Friday in clashes with the outlawed Kurdistan Workers Party (PKK) near the border with Iraq, Turkey's Defence Ministry said on Saturday. Demiroren News Agency said a military base had been attacked in the mountainous Cukurca district of Turkey's southeastern province of Hakkari, prompting the Turkish military to respond with a "large-scale" military operation. "As part of ongoing operations in the Turkey-Iraq border, two soldiers were killed in clashes with terrorists despite all efforts to save them," the ministry said, adding a total of four soldiers were killed and six wounded. 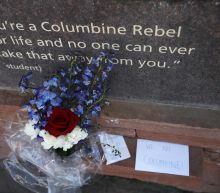 People are gathered in suburban Denver for a remembrance ceremony honoring the victims of those killed in the Columbine High School shootings 20 years ago. Saturday's ceremony near the school ends a three-day slate of somber gatherings honoring the victims and lending support to survivors, the school and victims' families. To symbolize that, artist Makoto Fujimura presented a 17th century Japanese tea bowl that was broken but then mended with gold, making it better and more beautiful.